The chart below shows the employment-to-population ratios for men and women by race. As mentioned in my previous post, this measure is the best one to use during recessions and recoveries. 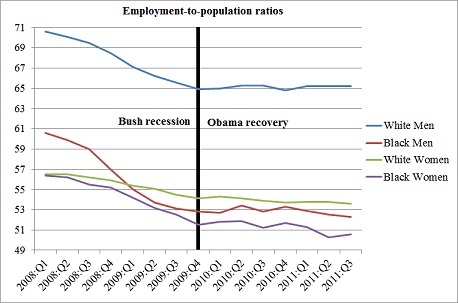 The chart also splits the period since 2008 into the Bush recession and the Obama recovery according to when the overall employment-to-population ratio bottomed out (as shown in my previous post). What the chart illustrates is that the Bush recession hit men harder than women and blacks harder than whites (both of these effects are standard during recessions). The employment-to-population ratios fell by 5.7, 7.8, 2.4, and 4.9 points for white men, black men, white women, and black women, respectively. The chart also shows that, of these groups, only white men have not lost further ground during the Obama recovery. The employment-to-population ratio for white men has risen by 0.3 points, but it has fallen half of a point for black men and white women, and almost a full point for black women.